The Big Ask. The Big Answer. Or, how D36 became its own cautionary tale. What started as a way to make full-day kindergarten work in Winnetka, mission-crept to the biggest ask in Winnetka’s history. On Tuesday, April 2nd, the Big Ask got an even bigger answer: No thank you. Times 2. Good news. The turnout was a not-to-be-scoffed-at 37%, give or take a tenth of a percent. Better than the Village’s 2014 ref on the stormwater tunnel, and enough to earn a decent place in the you’ve-got-my-attention-now hall of fame. Yea us! The real costs. Having to confirm them after they become public? Not a good strategy when your pitch is public trust. Early identification and buy-in among the 75% of the community that didn’t have kids in District 36 might have helped the District reality check before reality hit. The Kaegi Effect: The new assessor released property assessments the weekend before the election. And in an on-line minute, aspiration met a whole new level of tax aversion. Smart insiders pushed facts that resonated. Note to self: Refs that win usually have little or no opposition. Oh that pesky stealth v. transparency ethical conundrum. Lots of towns think it's OK to spend more on their schools than on any other part of their communities. (Looking at you, parks, libraries, and stormwater solutions.) Maybe the waterlogged mancave crowd wasn't feeling it so much this time around. And finally – underscore – they were warned. The District’s last survey delivered a boatload of potentially ouch-worthy data – like 57-68% of respondents were OK with essential repairs, but only 37% with upgrades. A lot like the ref's final numbers. Is What They Said What They Heard? What went wrong may have been lapped by ‘what did they think they were voting on.’ The jury's still out. Super Kocanda says "this was a referendum on our neighborhood schools." Was it? Or was it the extent of the ask, or just plain tax exhaustion? If, as Super Kocanda says, this is “not likely to be the only referendum,” answering this question will be Job 1.
Business as usual for the 5 schools. Same with you, Crow Island trailers. Until the next ref – if – you’ll see a reduction in the debt service portion of your taxes as it continues its march to zero, ending in 2022. "Urgent facilities projects," approved by the Board in February will get done this summer, using existing funds. Health and Life Safety issues in the schools will be “addressed,” again using cash on hand – what and when, TBD. That infamous lead in the pipes will be fixed. Signs taken down. We’ll learn what deferred maintenance means, since they promised to do it if the ref failed. And of course, although not a part of the ref, redistricting is on, as it always was. Who goes where, still TBD, but scheduled to be announced next fall. PS, the District says if you don’t like your plan, you might not have to keep it. The Process – is the one that got us here, the one that’s going to get us there? New consultants? New budget – taxpayer funded – for getting it right this time? The People – new core team? Would the district be brave – or smart – enough to build our very own team of rivals? Passion meet data. Think tank dream team. Ref 2.0, giddy-up. In this town, there’s no such thing as an average IQ. Surely, we can come up with something. And it’ll probably be closer to the right something. Hopefully, going forward, the voices of dissent will not be shamed into silence. Be brave. Stay engaged. Stay in touch. BTW – the soonest you'll see ref-redux – if – is next February. We've got 10 months. Class is back in session. Spot Check: District 36's $100.6 MM Big Ask. What's it Cost? What's it Deliver? It's Your Vote. It’s about numbers. It’s also about shared vision. And as always, "The Future of Winnetka." Tangibles, intangibles, and tax tolerance. In a town with ROI in its DNA, this is a tough one. Emotions are sure to run high. Get the facts. Then get to the polls. Run That by Me, Again? Winnetka’s School District 36 has a long-term wish list. Name: Educational Master Facilities Plan (AKA EMFP) – part facilities improvements, part educational upgrades. Multiple phases. Total Price tag: $148 MM – give or take a couple thousand. Coming to a ballot box near you. Total Cost: $150.6 MM. Your Share: $1,352. For Phase 1. Reality check. That $100.6 MM ask morphs into a $140.6 MM payout when you run it out for 22 years. Plus there's that $10 MM they would take from reserves. For a grand total of $150.6 MM. For which you'd be writing a check for $1,352 per $1 MM fair market value every year for the next 22 years. And if the Ref Fails? It's all or nothing. The District is playing for all the marbles. Without your approval, it's status quo. Plus $2.9 MM it says it needs per year to get the 5 schools back up to speed – think deferred maintenance – and keep the doors open. You'll get a reduction in your taxes as the current debt is retired, while the Board and Admin head back to the drawing board for a plan they think you could live with. Tangibles. Intangibles. Bricks. Mortar. Mortar Boards. Research shows that school district spending can do things like increase teacher morale, provide healthier learning environments, and enhance neighborhood property values. But improve academic achievement? Not so much. If teacher morale, property values, etc. are your metrics, this could be your ref. Just don't expect your 6th grader to split the atom any time soon. The District feels good about the numbers it knows. Between the bonds, the annual tax levy, and reserves, it thinks it can handle things. But what about…? Contracts. With the teachers and custodians. Through 2021 and 2023 respectively. Super Kocanda’s contract was just extended to 2023. Renegotiate or rehire? Either way, cha-ching. 25% of the District's teachers will be eligible for retirement by 2025. Future Ready could be an attractive acquisition carrot, but so’s cash money. No help from the State. Its new darling, "Evidenced Based Funding," doesn’t intend to pay to make Winnetka’s good thing better anytime soon. The ever-threatening tax freeze, and side-eyeing local school districts to kick in to the Illinois Teacher Retirement System. For an amount-to-be-named-later. Staffing costs and facilities modifications due to the adoption of the non-fee- based extended-day Kindergarten Program. Reserves. The cash-money-you've-already-forked-over reserves. The EMFP would tap $10 MM of it for the downpayment. How much would need to be replaced to maintain our current bond rating? And could that money have been put to better use elsewhere, like say, pensions? Other taxing bodies. Permitting, quid pro quos, and tax grabs the Parks, Library, Village, and New Trier Township may have in mind. And then there's this. The jury’s still out on the potential impact of these 49 Winnetka United families with their $1.1 MM in property taxes, but it represents the fragility of the demographics. What happens when demographers are more lucky than right? Finally, the winner of the who-couldn't-see-this-coming sweepstakes. Leading Chicago business group proposes raising income taxes and taxing retirement income to fix Illinois' finances. Deja vu all over again? Twelve years ago, the line items were the same, but the ask a few decimals short. Lack of foresight then? Overreaching now? And of course, everybody's favorite teachable moment: New Trier Township High School's ref reboot. Egg meet face. $100.6 MM of our money – 15 minutes of your time – 3 ways to get your vote done. Vote by mail right now – Apply on-line, ballot's in the mail, fill it out, send it back. Done. Looking at you, Snowbirds and Spring-breakers. Early voting March 18th – April 1st – Centennial Ice Rink in Wilmette's your best bet. Moved? Registered at your new address? Not sure if you’re registered? Check here. Referendum or not, this is an off-year. Only 5% of Winnetka goes to the polls in off-years. The biggest ask in Winnetka's history decided by 5% of the voters? That's quite an ROI – for somebody. Educational Master Facilities Plan – backstory, research, conclusions, timeline, concepts, costs, and more. Referendum – Tax calculator, school Fact Sheets, presentations, and more. Neighborhood meetings, road shows, one-on-ones. "Shall the Board of Education of Winnetka School District Number 36, Cook County, Illinois, improve the sites of, build and equip additions to and alter, repair and equip existing buildings, including, without limitation, constructing safety and security improvements, increasing accessibility under the Americans with Disabilities Act, replacing electrical, plumbing, mechanical and HVAC systems, complying with the Health/Life Safety Code, renovating classrooms and Resource Centers/Libraries and adding multi-purpose/lunchroom space and gym space, and issue bonds of said School District to the amount of $90,600,000 for the purpose of paying the costs thereof?" Spot Check: District 36. The Big Ask. $100.6MM. Spring Ballot. ﻿In Less than 80 Days. Last June, residents said Winnetka was all about neighborhood schools. (We covered it here and here.) The School Board said OK, and in October passed the $148.8MM 10-year, multi-phase Educational Master Facilities Plan. Then spent the next two months whittling down expectations and expenses to what they think is a taxpayer-tolerable, referendum-passable $100,600,000. The biggest ask in Winnetka's history. According to the consultant, these are "concept numbers based on concept drawings," with contingencies for "market conditions and design decisions." Whew. Watch for the drill-down if and when the referendum passes. In the meantime, try here for interactive diagrams and long-term costs per school. The district will spend $1.5MM to get it up to speed and keep it going until all renos and additions are done. They'll use it as "swing space" where various 5th/6th and 7th/8th grades will call it home until their Washburne classrooms are done. After that, they're thinking rental, long-term lease, or public space. No takers yet. The District's created what they ca'll a “tax impact calculator” to help you figure out how much more you'd pay in taxes if the referendum passes. Put your numbers in. Take it for a spin. Caution: It does not account for the decrease in rates you would have gotten when the current bonds are retired, or increase in rates from the just-passed levy. Thinking is, if the referendum fails, you'll get a tax cut as current debt is retired. 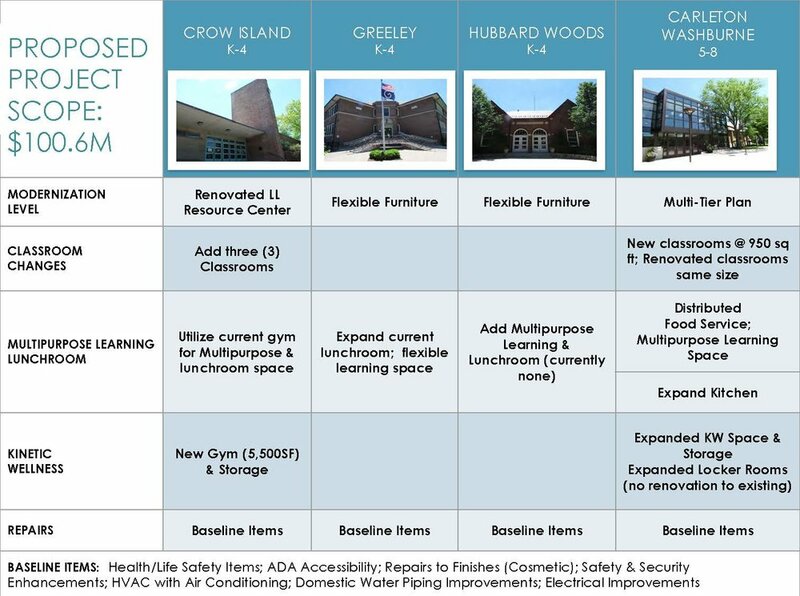 The District will spend what it needs to keep the doors open in the five schools, deferring maintenance and addressing "only the most urgent needs." And just when you've gotten used to those temporary classrooms at Crow Island, you'll likely face Referendum Redux in 2021. When the District's done crunching numbers for costs and savings, they'll post them here. Soon. Hopefully. ﻿Regardless, redistricting is on. Fall 2020. What More Will You Want to Know by the Time You Vote? The Tax Calculator gives us the above what we're now paying number. What's the total cost per household for Phase 1? What’s the plan for the rest of the Plan if residents max out their tax tolerance before Phase 3? With the current economic and demographic uncertainty, why now? 2028 is a long way off. What if the stuff that got them here –'transitions are bad' and 'collaborative space-is-good' – doesn't work when they get there? Any plan for a mid-course review and reboot? Would the Board consider reducing its future levy requests, or at least not taxing to the max, if there were to be operational savings from Phase 1? They want it, you’ve got it. There’s no sitting this one out. You've got three chances to vote. And not one excuse not to. Right now – Vote by mail. Apply on line, they'll mail you your ballot, fill it out, send it back. Done. March 18th – first day of early voting. Your best bet is Centennial Ice Rink in Wilmette. April 2nd – Hey! Where’s my polling place Moved? Not sure you’re registered at your new address? Check here. BTW, if you’re just hearing about this now, you’ve got a lot of catching up to do. And just a few short weeks. Let the cramming begin! Educational Master Faciities Plan – backstory, research, conclusions, timeline, concepts, costs, and more. The Referendum – financial info, tax calculator, outreach plan, and more. Neighborhood meetings, road shows, one-on-ones. Show up, ask questions, get answers. Referendum or not, this is an off year. Only 5% of Winnetka goes to the polls in off years. The biggest ask in Winnetka's history, decided by 5% of the voters? Don't let that be on your watch. Vote. Next School Board Meeting - Tuesday, Jan. 29, 2019 - 7:15 p.m. Hubbard Woods Auditorium. Pass the Word – and this Spot Check – to every Winnetka voter you know. Spot Check: Signed, Sealed, Delivered. Almost. Dateline: Tuesday, October 16, 2018, Village Hall. ﻿Thirty-one months, 32 hearings, one group presentation, three ordinances, two resolutions-turned-ordinances, a gazillion staff hours, countless reams of paper, and enough legal and board time to keep clerks and rendering artists in kibble. For a long time. One Winnetka, the project that virtually defined onerous, even by Winnetka standards, took less than seven seconds to land the votes needed to reach reality. The newly-empowered DRB will get with the architect and Community Development Director to hammer out the final look and feel. Value engineering meets managed expectations meets something called "what's good for Winnetka." The VC will not see the project again, thank you very much. Unless no kumbaya. Then we’re talking amendments, and one very miffed Village Council. 131 underground parking spaces for commuters, employees, and the public which the Village will own and operate. AKA 736 Elm. AKA The Get. Pocketing that parcel is Job One. According to the Planned Development Ordinance and the Development Agreement, no Conney’s, no One Winnetka. The clock is ticking. The developer's got 'til midnight, December 31, 2018 to ink that deal, give or take a couple of 90-day extensions. We're betting the VC that's taken this long to get this far will be generous. From shovel-to-dirt to Honey-I'm-home, are 24 months of dust, debris, and disruption. Here's how the VC – and the Village Attorney – intend to earn Big Cred. If the design and density still don't do it for you, they're hoping this kind of due diligence will. Monthly meetings (at least for year one) between the developer, Hadley Institute, and 711 Oak to make sure patience keeps pace with progress. Hadley Institute Safety Plan and Landscape Plan. Streetscape Plan. Both sides of Elm and Lincoln. Sweet. $4.2 million worth of Village improvements and wish list check-offs, by the Village's numbers. Pesky little exigencies of life like garbage pickup and cooking smells - moved out of eye-, ear- and nose-shot. And building permit fees maxed at $375,000 help cover the cost of other things the VC wants to do. Letter of Credit and proof of project financing. Guarantee of Completion – "absolutely, unconditionally and irrevocably." And no flipping. Dancing with the one who brung us until the certificate of occupancy. Lot 3. All forty-nine thousand, three hundred and ninety-nine square feet of it. One hundred and thirteen parking spaces the Village will own. One-point-one-three acres smack in the middle of One Winnetka. Anything happens to One Winnetka – as in default, transfer of ownership, failure to comply, failure to complete on schedule, or any other failure listed in the Development Agreement – the Village says it's got a seat at the table. Eyes seriously on the prize. Hakuna matata. On-site Compliance Inspector. Outsider, no conflicts of interest. Hired by the Village, paid by the Developer. $30,000. We'll get you the name, number, and a magnet for your fridge. Until then, keep the Community Development Department on speed dial. Promises made. Promises kept. Five documents, 329 pages of whereases, wherefores, and what-happens-ifs. Promises turned policy. If it’s not in here, it’s not. The Village Attorney’s legalspeak-lite cheat sheet. Exhale. Moving on to Stormwater and a Downtown Master Plan. Never a dull moment in our little Piece of Paradise. Core Team to School Board: K-3. School Board to Core Team: K-4, and you're so not done. It was not unanimity's night. On Wednesday, June 6th, at its last – and arguably, longest – meeting of the school year, the Winnetka School Board made the first of many tough choices. 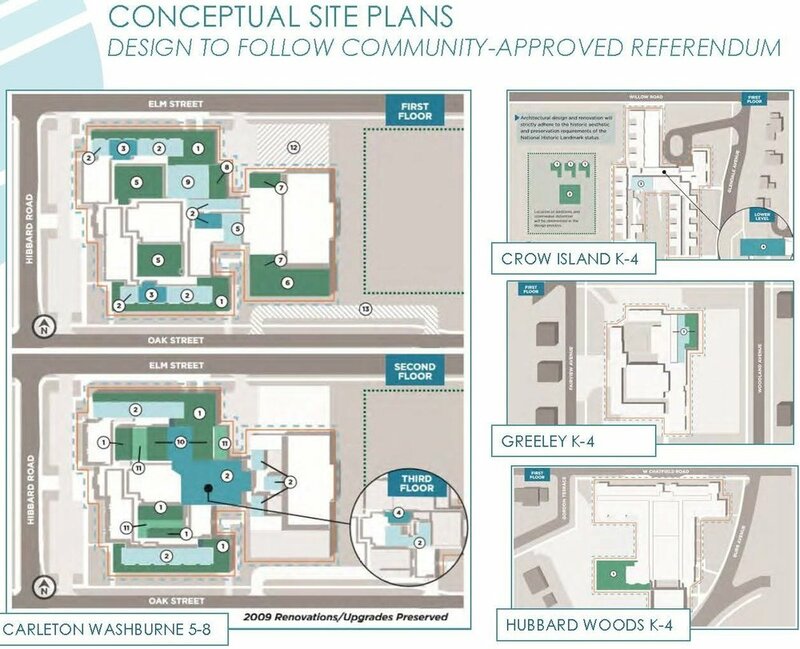 In a "we're not calling it a vote" vote, the Board went cautiously thumbs-up for K-4 – the version of its Education Master Facility Plan that keeps Kindergarten through fourth grades in neighborhood schools, moves fifth and sixth grades to Washburne, and shutters Skokie School (for now). Ouch. The Core Team – at least the majority, cue video – had just raised its hand for K-3. The one that does a lot of that, plus groups classes by learning styles, disrupts the least number of families, and delivers the most enrollment flex. Biggest bang. Biggest bucks. They said. 'Go big, go bold!' only goes so far when you're working with other people's money. Taxpayer hats on, the Board went with possible over preferable. Roberts: On Board’s Financial Committee, respected the work, struggled with the numbers. What-if'd 'no new taxes,' and when that turned rhetorical, decided still too many unknowns, wanted to keep all options on the table, and went for K-5. For now. Pehlke: As Board Liaison to the Core Team, spent the most time with them, appreciated “philosophically the benefits of keeping grades 4,5, & 6 together,” still, wanted to keep K-4 on the table. Livingston: Supported the Core Team, swayed by educators liking K-3, claimed that “the community doesn’t like change," and went with K-4 because it’s what they know. Felt K-5 was a “colossal waste of money,” and probably wouldn’t vote for it in a referendum. Conine: Not feeling it yet. Felt not enough info to decide, so abstained. Wanted to know what the real pain was, how much modernization increases property taxes, and what residents think. Hertel: Board Prez thinks “K-5 makes no sense on so many levels,” ticked off options, landed on K-4, urged the Board to figure out what success looks like, and promised that if the numbers don’t work, the other options may reboot and repeat. Fifth grade. Will it get its own school-within-a-school? Be grouped with 6th grade as it is now? Those numbers for levels of “modernization?” Tight enough by August to take to the bank? Outreach. Ah, outreach. Poll? Survey? Engagement sessions with give and take? Before or after the Board’s decision? Some Board members still desperate for metrics. Will cost-per-square-foot be one of them? Still looking for that ROI. If it's the wrong question, what's the right one? Three of the seven Community Members on the Core Team don’t want K-5 to go away. Will it? The Core Team's Summary to the Board. Summary of Research on Transitions. What classrooms in utopia look like. A best-seller from our last Spot Check - Enrollment Balancing Project. Something veeery interesting. How Washburne kids do at New Trier - compared to kids from other feeder schools. Surprise! Knock yourself out. Here's almost every last thing the Board or Core Team's ever published. Now you know what they know. Want more? Binge watch Board Meetings and sign up for a heads-up. Then pencil-in the next School Board Meeting: Tuesday, August 21st, 7:15 pm, Hubbard Woods School. The board gets it. They know going to referendum with just a quarter of the community isn't going to cut it. They also know this town has a history of doing just that. They don't want to be that guy. They’re going to ask you again what you think of the plan. Make sure you know what they’re really talking about. Contact the School Board for anything else you need to know. Spot Check: Deliberation, Check. Taxation, Check. Representation, TBD. On Tuesday, June 6th, the District 36 School Board was expected to meet with the Core Team and go lid-down on 11 months of meetings, field trips, PowerPoints, engagement sessions, and shared documents. The agenda: Deliberate, debate, and decide the fate of the Future Ready Educational Master Facility Plan...and of every taxpayer in Winnetka. But on Tuesday, May 22nd, an hour after “just to be clear, the Board anticipates approving a long term Educational Master Facility Plan at the June 6th meeting,” the School Board’s rep to the Core Team went all hmm, maybe not so much. Concept. Singular. Transform and Maintain are out, for now. Enhance is in. Just the concept, not the name. Three versions - K-3, K-4, and K-5. Five schools reduced to 4. Yes, neighborhood schools. Rinse and relentlessly repeat. Four transitions reduced to 2. Lower grades – neighborhood schools. Upper grades – Washburne. Definitely deja-vu-all-over-again. Think pre-1998. Enlighten yourself. Done deals: Health and life safety items, ADA accessibility, “cosmetic updates,” safety and security enhancements, HVAC with A/C, domestic water pipe improvements, and upgraded electrical capacity. Financing options – plural – out. Referendum – in. School boundaries. Oh, they will change. But, how much and where? Neighborhoods, start your engines. Check out the Enrollment Balancing Project. The roll-out. How, how much, and when? As always, how much Future Ready is ready-enough for Winnetka? In dollars, disruption, and deliverables. Referendum Fall or Spring? Looks like Spring, right now. How Will the Core Team Tee it Up? Six teachers, six administrators, seven residents, one School Board member. One honkin’ big decision. They’ll probably reboot the research for clues on grade levels and Future Ready outcomes, review and possibly revise those pesky enrollment projections to the requested "average-plus-one-standard-deviation," model how to balance enrollment with the least disruption of school boundaries, rework architectural renderings. Then give the Board at least one reason to reduce and return. Over and over again until they get it juuust right. Then block all calls and call it a day. Which day depends on how curious and collegial the School Board is. It’s been almost a year. Eventually the School Board will have to dump that waiting-for-Godot thing and make a decision. The Core Team can only tell what it knows. 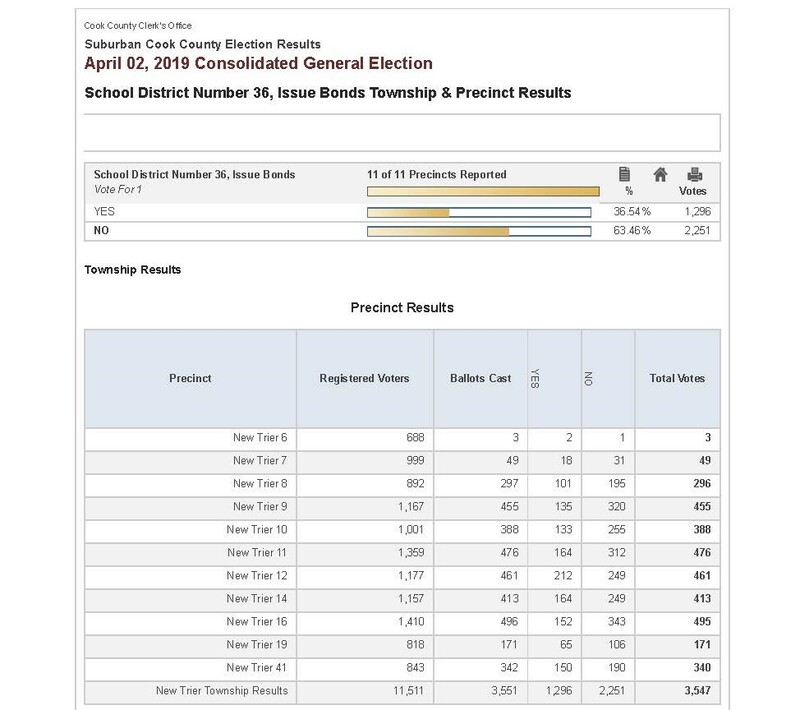 The residents that don’t have kids in the school system (looking at you, Significant Seventy-Five percent) can tell what will pass a referendum. Exclude them at your own peril. Right, New Trier? Sticker shock. And a Transform reboot? The one with kindergartners and first graders in one school, and the rest in a spanking new Skokie School. No neighborhood schools. No neighborhood boundaries. No rebalancing. And full-on Future Ready. Upgraded engagement. Only seven residents on the Core Team? Fuzzy math, say some. Bugged about taxation without representation, they want town halls, focus groups, and answers. Sounds good to us. R.O.I. As in our kids’ futures per dollar spent. Will the folks who graphed and charted the condition of our buildings, graph and chart the academic uptick for our $100M and beyond? Speaking of which… Hard numbers. Capital costs, operating costs, financing costs. With and without options. And second opinions. New tax laws and possible pension reform. If the public’s appetite for high-ticket items, no matter how juicy, goes all Weight Watchers, will charitable gifts become the new ask? Other taxing bodies, AKA Park District, Library Board, and Village. Their to-do’s and our tax dollars. Culture. The Winnetka Way. Ubiquitous, unquantifiable, easily underestimated, and dangerous to ignore. The next Core Team agenda. Always good to know if what they think they heard is what the School Board thinks it said. We’re still a couple of School Board meetings away. And no meeting in July. So far. Follow the progress. Here’s the Wire and Board Newsletter sign-up. Review the demographics, transitions research, and even the Enrollment Balancing Project to see why redistricting is probably not optional. Don’t be a stranger. Calendarize upcoming School Board meetings. Info's always better first-hand. And contact the School Board, or the Core Team with any questions, comments, concerns. If you’ve got an opinion, they’ve got an ear. Pipe up. You’ll be wasting everybody’s money – including your own – if you wait until the referendum to tell them you don’t like the plan. Don’t be that person. Spot Check: How Future Ready is Your Checkbook? The future is one step closer. We’ve got numbers. ﻿And another option. And a special School-Board-on-Core-Team meeting, Tuesday, May 8th. Marching orders, here we come. On Tuesday, April 24th, the School Board listened to one-and-a-half-hours of Winnetka’s a great place to live, and neighborhood schools are the main reason to live here. Then did a 180 into what the Future Ready Core Team’s been up to this past month. Namely our places, their spaces, and the dollars to deliver them. For the next generation of learners. Green shades on. Bragging rights or side-eyes, the educational cost-per-child is going up. Cost-per-taxpayer, TBD, but this is what we know. Plus or minus 5%. From minimum to keep our buildings from deteriorating - upgraded electric, basic health and safety issues,etc., maybe kitchens and HVAC - to full-on Future Ready. Depends on how new, how many buildings, and how much Ready is future enough. There's more, so much more. Here's your drill down. They’re thinking referendum, lease certificates, or alternate revenue bonds. Debt limit’s $96.9M right now. Springfield would have to OK anything more. Consolation or not. Pluses, minuses and discussion. Intel on how the new tax laws will impact voters' pockets and the will to spend...er "invest." Contingencies for other taxing bodies' to-do lists, and because life goes on, other District 36 initiatives. Reliability of the demographic projections. District 36 is only one bad private school principal away from being swamped again. And what's with that 5 years out thing? The Village's culture (AKA Winnetka Way) just joined the cost and capabilities convo. How the Board will calculate its impact. More surveys? Engagement sessions? The ask in real dollars per each of our personal bottom lines. Tuesday, May 8th. Special session of the School Board - Hubbard Woods School Auditorium. 7:00 pm. ﻿Major sifting and winnowing, and hopefully marching orders and a tight leash for the Core Team, whose deliverables include an analysis of light, medium, and heavy options for each concept, construction costs and phasing, and better enrollment predictions. How Future Ready are You? They’re going to do something. You’re going to pay for it. It’s probably going to involve neighborhood schools, and it’s definitely going to involve redistricting. It’ll cut some of the transitions, you’ll get A/C and kitchens if you want them, and hopefully enough outlets for everybody to recharge – literally and figuratively. And you're probably not going to like all of it. Do yourself a favor: Don’t wait until referendum to voice your opinion. Referenda cost real cash money. Your tax dollars. The Future Ready website is ready and waiting with podcasts, a drill-down of the numbers and how they got them, demographics, agenda reports, research on transitions, surveys and analysis, and (yes!) more. Even the Big Picture. Smartest person in the room, here you come. Tuesday, May 8th. Special session of the School Board - Hubbard Woods School Auditorium. 7:00 pm. Core Team on the hot seat. Future Ready 2.0 on deck. Know where they're going. Sign up for the District's newsletter, The Wire. And as always, stay tuned to Spot Checks - we'll bring you stuff as it happens. Tear down Washburne? Get rid of neighborhood schools? What will it take to give our kids the best chance at competing in a 2025 world-to-be-determined? Board Meeting Tuesday, March 20th.﻿ Raise your hand. On Monday, March 12th, District 36 presented its vision for the future. Packed house. In two-and-a-half hours, our Village of Learners learned that our school buildings are too old, too hot - no, too cold - and their walls are bereft of outlets, that our classrooms and gyms are too small, that kids - especially pre-adolescents - don't do well when moved from place to place, that accessibility is no longer optional, and that parents have packed one sack lunch too many. Oh, and our enrollment is declining. Our schools rank high on the list of why people move to Winnetka. But that shiny new thing on the corner of Willow and Sunset Ridge could be making our School Board's "good teachers, bad places" blues worse. So the Board hired a consultant. Launched a master plan - called it "Future Ready" - researched, road-tripped, and recommended. Three "of the most fiscally responsible concepts" later, they're taking questions and fine tuning. Break it Down for Me, Please? All three concepts cover must-do’s (think accessibility, A/C, kitchens, upgraded electrical, basic health and safety issues, etc. ), shift the current school boundaries, and reduce the number of transitions. Pricetag: $22.4 million - $33.7 million if you want A/C. “Enhance” and “Transform” add Future Ready learning. Pricetag: TBD. In 2017, 38.6 cents of every one of your property tax dollars went to the Winnetka School District. Whether you have kids in District 36 schools or not. And roughly 75% of you do not. This is their best thinking. Now it’s time for yours. Sift, winnow, maybe take one from column A and one from column B, and decide what you want and will pay for. Consultants will cull, spreadsheet, add dollar signs, and hand off their final best case to the School Board. School Board who will one-on-one and when they're done, tell you how and how much you'll pay for the future of District 36. You've got three months. The District's been working on Future Ready since July. Whether you think it's long overdue or would like to see a little more "make do," they want to hear from you. Do your homework, ask smart questions, get the answers you deserve. ﻿Stay tuned to Spot Checks - we'll bring you stuff as it happens. One Winnetka – It’s baaack. Or at least two-thirds of it. And so's the name. On Tuesday, December 19th, reality body-slammed rhetoric. Claiming financial hardship – and a $5MM saving – the developer of One Winnetka walked his project back. Gone - the Lincoln Avenue promenade and its underground parking. Moved - the building, 40 feet to the East. Added - a second level of underground parking adjacent to Hadley School. Asked for - a portion of the Village’s east side parking lot. The developer's no big deal, was the VC's big-enough deal, so it's back to the Plan Commission, Zoning Board of Appeals, and Design Review Board to see if the changes are as good for Winnetka as they are for the developer and his investors. What's next: Developer puts how-to's and how muches to paper, presents to all boards - same time, same place. Boards chew on changes only. Personal likes, dislikes, and side-eyeing the developer’s ability to deliver, checked at the door. Then it's back to the VC for the final thumbs up or down. [2:10:00] Maybe a 3-month round-tripper. You're right. The Planned Unit Development (PUD) Ordinance says 18 months from the January '17 preliminary approval to put shovel to dirt. Final plans were due right about now. What to watch for: The developer says this move gets him "60% of where we need to be." [36:50] At least one Trustee is wondering the fate of the remaining 40%. TIF – Let’s make a deal. While claiming to anyone who will listen that TIF (Tax Increment Financing) is still TBD, the Village is presenting its case to anyone who asks. The Village's agenda, but all taxing bodies' money. District 36, Parks, Library and New Trier School boards hired their own consultant who's not as sure as the Village's consultant that downtown’s in need of that much of a fix. District 36 defined "that much" as $2,000 per $10,000 tax bill on a 23-year TIF. New Trier defined it as "a few dollars in the first year, and up to $13-$14-$15” per $10,000 tax bill" [54:00] on an 8-9 year TIF. What's next: Taxing bodies tell the Village what it will take to TIF. New Trier's in at 8-9 years and $10-$14 million in revenues, plus money for new students. District 36's still thinking. TIF, no TIF, or TIF with benefits. Parks and Library are supposedly dealing. Just not talking. When the deals (AKA intergovernmental agreements or IGAs) are done, the Joint Review Board (JRB) reviews, votes and tosses it back to the VC. More talking. More voting. What to watch for: If TIF gets the final nod, the JRB will make sure what it agreed to is what the Village ends up with. Stormwater – Now you see it, soon you won’t. Well 92% of it. Promising "significant relief" to 474 of Winnetka's most waterlogged homes, [14:20] the Village is working on IGAs with the Park District, District 36, and New Trier School District, and "a couple of private property owners." Everyone's "committed," [11:52] but right now, only New Trier’s dealing. Looking to trade reno’d playfields for more storage which means that 92% of our stormwater problem will be underground or in the Forest Preserve [18:05]. Quid pro perfect, say great horned owlets and dog walkers. Up next: Park and District 36 IGA's, one-on-ones with private property owners, back to the dugout to see if what everybody wants looks anything like what everybody agreed to, then cost out, bid out to one or two who’ve actually done this, and back to the VC for financing, how-to’s and a timeline. Tinker. Evers. Chance. Spring for stakeholders, early summer for financials, and late September-to-early-November for a Forest Preserve confab. Druthers. What to watch for: No bells, no whistles. "Except for a few water features on the 9-hole, this is an infrastructure project, plain and simple.” [17:00] Accent on the plain, not so much with the simple. It’s all about hotspots. And IDOT. On Monday, Feburary 26th, the Downtown Master Plan Steering Committee presented its Streetscape and Signage Plan. Not to be confused with the TIF infrastructure wannado’s, or the Streetscape Plan that was nixed eight years ago. This one ID’s “hot spots” – pockets of activity on East and West Elm – and the Elm Street Bridge and Green Bay Road. Think, crosswalks, lighting, signs to tell you where you are and where you’re going, business directory and community kiosks, seating, bike racks, and possibly new trees and planting. What’s next: The 2020 Comprehensive Plan (the one that makes Winnetka Winnetka) was big on residential, not so much on Downtown. So the VC created a Task Force, OK'd the Downtown Master Plan, and budgeted for some low-hanging fruit. Also called for a look-see at new retail and new zoning to make it happen. Which means a reboot - and a new name - for the 2020 Comp Plan. Chicken meet egg. What to watch for: VC says the new streetscape needs to be good enough to make us proud - not so good that it can't be made better if zoning and the Comp Plan have other ideas. It's your turn. Batter up! Vote! Who you vote for is your business. That you vote is everyone's. Early voting is on. Election day is March 20th. Check here for all the voter info you need. Take the Village's Garbage Collection Survey. It may not be a big deal in the dead of winter, but come Spring, you'll probably wish you'd taken this pitch. You have until March 23rd. What's this about? Need background on OW, TIF, Stormwater, or the DMP? Check out past Spot Checks. Introducing the first in a 3-part series on an economic development tool the Village thinks might be able to jump-start downtown revitalization. What it is, why, and what’s in it for you.Get ready to geek-out - it will be worth it. Winnetka’s 100-year-old infrastructure is becoming about as reliable as a teenager on prom night. And our broken-sidewalk-and heaving-brick downtown is forcing businesses, attracted by our mouthwatering demographic, to move on. The Village thinks it’s found a “no-new taxes” way of giving you a downtown that “creates a framework that this community deserves and one that will better support the money we have invested in our homes…”[26:12]. But first, it must convince the Parks, Library, and School Boards to take one for the team. In 1997, the Illinois State Assembly passed the Tax Increment Financing (TIF) Act. A gazillion words of govspeak that says towns like Winnetka can fund the renovation of underperforming or declining neighborhoods with the increased tax dollars that are expected to come from those improvements. If the neighborhood and the proposed reno projects qualify. Winnetka’s does. The East and West Elm Business Districts have been going downhill for years. The Village’s to-do list passes muster. A town’s neighborhood-in-need meets the TIF Act criteria, creates a “TIF District,” projects costs and revenues from those improvements. Taxing bodies hammer out “Intergovernmental Agreements” (IGAs) - outlining risks, rewards, and mutual responsibilities. Town establishes a Joint Review Board of stakeholders to keep an eye on the process and progress, gets residents’ buy-in. Town greenlights the ordinance that defines the scope of the renovation, and creates the “TIF Fund” that banks all new tax dollars from the improvements for as long as the TIF is in place. Why TIF Now? Why Not Taxes or the Village’s Reserves? The Village thinks with its measly 13% take home from your property tax dollars, it would take decades of more decline – and future Village Councils – before the projects are paid for. Stormwater has earmarked our reserves – and then some. Special service areas and yet another utility all mean new taxes. One Winnetka is expected to generate $33MM+ in new tax revenues over the next 23 years. The sooner the village TIFs, the greater the reward. True, the Village penned the One Winnetka deal. But because some of Winnetka’s other taxing bodies get a pretty sizable cut of your property taxes, they're looking at some pretty juicy returns. So sitting on their hands may be a big ask. Maybe not, says the Village. Everybody gets every penny they’re entitled to now, and continues to get for the life of the TIF. When the TIF is retired - 23 years or sooner if the projects are paid off early [31:30] – all taxing bodies get their piece of a potentially bigger pie. Then there are those tax benefits of "unrestricted funds"... [31:12]. Who’s In? Who's Out? Who’s Not Sure? District 36 – In the boat on a better downtown, but just got rid of $30MM in debt. We've got a to-do list of our own. TIF or taxes? Need help explaining to families. New Trier – Thanks for the help on our reno, but no quid pro quo. We’ve got constituencies – they’ve got needs. But glad to talk. Library – For now, just want to be at the table. Parks – For now, radio silence. Winnetka’s never done this before. But other nearby communities [think: Evanston, Highland Park, Deerfield, Skokie, Glenview and more] have been TIF’ing like crazy. If the Village can kumbaya, there’s plenty of paper on how to do it right. State limits how you can spend the money. Public improvements only. No funding private development. 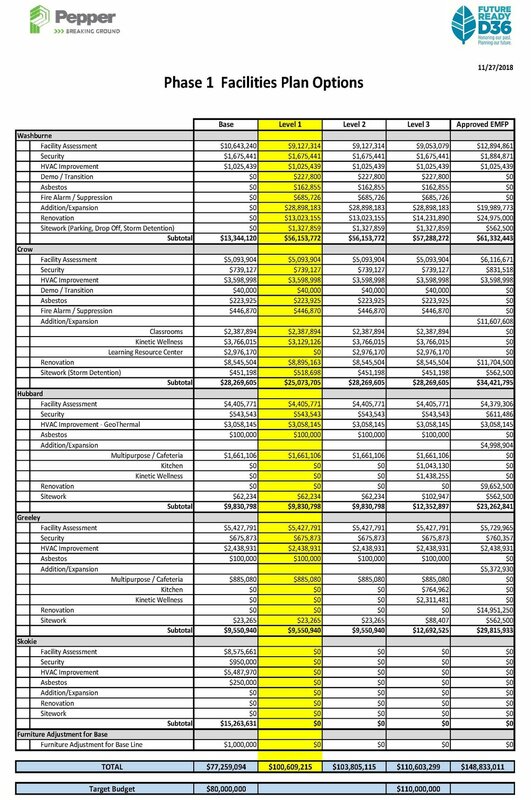 State limits spending to only the specific projects outlined in the TIF Fund. And only projects in the TIF District. How Winnetka might spend. Only certain costs are eligible. All taxing bodies continue to receive the base property tax revenues they get at the start of TIF [AKA, Baseline EAV]. Increased revenues end up in the TIF Fund. If the Village can kick-start the TIF before One Winnetka breaks ground, the upside is maxed. The TIF can close out early. Each taxing bodies cuts its own deal. The TIF ordinance can’t be changed without going through the whole process all over again. What is TIF and how does it work? October 10th Village Study Session - Know what they know. President explains, Ehler's presents [33.25], Trustees discuss [53:00]. Contact the Trustee of your choice with your questions, comments, concerns, insights. Spot Check: Great Stuff We Bet You Didn't Know About President Rintz - But Will be Glad You Do Now. White hair. Black dog. Hard to miss. Even harder to pin down. Unless it’s Saturday, you’re at Starbucks, and you’ve got a beef. Then he’s all ears. And so’s Bailey, Winnetka’s First Dog. One recent Saturday, we had questions but no beef, so we had to wait our turn. After dispensing with the usual “What’s your finest hour?” ("Stormwater MOU") and “What’s your biggest fear?” ("Stormwater") we dove deep. How do you see the role of the Village President and how's it different from your former role as Trustee? This job's "dirty little secret?" "The amount of time and effort that goes into intergovernmental issues. There is a spotlight on our community. The stormwater negotiations were just one example. I spend a surprising amount of time representing our Village to the regional, county, and neighboring municipalities. There's much more work than what you see on Tuesday nights." The Village Board is only one of Winnetka’s taxing bodies, and although a lot of residents think the Village Council runs the show, it doesn’t. How do you coordinate with Parks, Library, and Schools to make Winnetka work? Quality of life. Why do you think people want to live here? What do you think is special about Winnetka? "Winnetka has a lot to offer - the lakefront, the Village's walk-ability and sense of history. But it's the people who make it truly a special place - people who I believe want to live here because they recognize the importance of a good education and a comforting lifestyle." With the spotlight about to be aimed on the Downtown Master Plan, should Winnetka be competing for new residents? If so, how? Do you believe in “no new taxes,” and if so what are your thoughts about how to keep Winnetka running? Reserves are a perennial - and controversial - issue in municipal budgeting. Your thoughts? What’s the most overlooked issue facing Winnetka today? At the Village Council meetings. Check out the calendar. If you can't make them, check out the videos. At Starbucks – just about any Saturday morning. ﻿At Peet's on select Saturdays. Cwoffee twawk with the Village Trustees. Read Up – Council Meetings have great agenda packets. Pretty much primers on the stuff Trustees use to get up to speed. Know what they know when they know it. Dial Up – Remember that “How can I participate?” thing? Operators (AKA, President Rintz et al) are standing by. Don’t be a stranger! Spot Check: The VC's Sizzlin' Summer. And We're not Talking Temps! Welcome Back! What You Need to get up to Speed. No vaca. Not even a stayca. Here’s how your Village Council spent its 97 days of summer. Hubbard Woods Metra Station is on the mend. Sort of. Termed "an eyesore and dangerous." Worse yet, we don’t own it. Supposedly, rehabbing Hubbard Woods station was on Metra’s mind, and the Village agreed to rattle the bushes – but gently, since Metra’s default was to close the station down. Touch and timing are everything. Witness: new stairs. Total rehab or a quickie fix? TBD. Lincoln Avenue Parking Lot gets a facelift. Tax Increment Financing Feasibility Study deemed TIF, um, feasible. To the VC, this is a no-new-taxes way to fund downtown redevelopment with new property tax revenues generated by, among other things, One Winnetka. But first, it’s got to make the case that without this TIF, the area is not attractive to developers, then convince the School, Park, and Library boards – and other taxing bodies – to take one for the team and forgo their short-term tax revenues for bigger bucks down the road. One Winnetka filed for final approval. Morphing inexplicably into The WINN, it worked its way through the advisory bodies one last time. Of the Zoning Board, Design Review Board, and Plan Commission, one lone commissioner still not feeling it. Next stop: Village Council to review site engineering, utility, stormwater, and public improvement plans, and make sure final plans look like the preliminary ones it saw nine months ago. Shovel to dirt, TBD. In March, the Village Council decided to repurpose random monies from the downtown revitalization to-do list into an extensive reno of the corner of Spruce and Chestnut. “Fred’s Garage” was already in the process of making that happen, and the area was due for a facelift eventually anyway. Fast forward, bids came in and the lowest of the six was still $151,000 over budget. The Village will re-estimate the project and tee it up for 2018 budget discussions. The Government Finance Officers Association loved our budget. Again. For the umpteenth year in a row, the independent GFOA gave us itsDistinguished Budget Presentation Award. Said our budget works as a policy document, a financial plan, an operations guide, and is easy to understand. And better than most. Rest easy. If you don’t like the budget, at least, they said you can understand it. John Swierk filled final Trustee seat. Admit it, that empty seat was getting kind of creepy. Vacated when then-Trustee Rintz became President Rintz. Trustee Swierk was chosen for past gig and cred. As a former Design Review Commissioner he’s more than familiar with what makes Winnetka Winnetka. And knowing how things work is always a good thing when the cameras are rolling. Swierk will serve until Spring 2018 and then decide – or not – to run for a full term. ...when he made the Mother of all Decisions and OK’d the go-ahead on the Memorandum of Understanding (MOU). Stormwater solution, giddy-up. In the finest hour of a process that took almost 24 months and redefined “arduous,” President Rintz polled the house [1:27:00] for support for the go-ahead. Unanimous show of hands and most certainly a boatload of votes for Commissioner Suffredin. How-we-got-here's and what's-nexts. What to Watch for While Root-root-rooting for your Teams. Team VC promises to be as busy as usual. Team YourWinnetka promises to keep you informed. Water main. 100+ years old and about as reliable as a teenager on prom night. Ironic: the water that gives us so much trouble when it comes into our homes gives us just as much when it doesn’t. The VC’s on that first part, and is teeing up the second. Budget-time can’t come fast enough. Here it comes again. The Post Office property is part of the proposed TIF district, and considering the recent Dwyer Park reno, should make for interesting conversations. The Downtown Master Plan Steering Committee is due to begin shaping the look and feel of our downtown. Follow us follow them as they grapple with zoning, parking, parklets, signage, and other items that will define our downtown experience. The MOU was just the beginning. From the jaws of defeat, the VC will sink its teeth into building a lasting stormwater solution. We’ll bring it to you. Bite by bite. Caucus Survey – coming your way in September. In a town of 4,000 households, there is no “them.” There’s only each of us with a voice, an opinion, and an insight. Complete your survey, submit it, and earn the Village you deserve. Spot Check: Stormwater. Cook County's In the Boat. Are You? It took almost two years, but finally last Thursday, as the skies darkened, the North Shore braced, and the media relentlessly texted and tweeted flood warnings, the Cook County Board gave a unanimous thumbs up to aMemorandum of Understanding, green-lighting what will now be known as the "Stormwater Management Wetlands Project,” and ushering in the first day of the end of our water-logged lives. How many ways can you say, "win-win?" They get: a totally restored wetlands with a few perks thrown in. We get: a place to put our water...and a totally restored wetlands with a recreation destination thrown in. If all goes to plan. A deal? Not exactly. More like a gentleman's agreement, but with a "high degree of certainty that the license agreement necessary for the project will ultimately be approved by the FPDCC Board of Commissioners." That "license agreement" thing? Intergovernmental Licensing Agreement, or IGA - puts the period on our partnership with the Cook County Forest Preserve. The handshake. The intergovernmental kumbaya. The Plan for the Plan? Getting to the IGA will be a new kind of interesting. As soon as the VC gives Manager Bahan the go-ahead, Strand will nail down the technical specs creating enough drainage to make Mosquito Abatement’s day and encouraging the kind of positive environmental impact advocacy groups (AKA Open Lands and Friends of the Forest Preserves) dream of. A recent and major addition to the conditions says we've got to get our upstream ducks in a row before the ink dries on the IGA, so next it's bye-bye Strand's elegant staged rollout, hello multitasking. Fast-tracked. Watch for one-on-ones with the Park District, District 36, and New Trier, Strand for "budget implications," and the VC for how-we're going-to-pay-for-thats. Pretty much in that order. Finally, one more round with the Cook County Board, back to Strand for final engineering drawings, then out the door for bids. Exhale. Dateline: TBD. "As much time as it takes to get it right." July 2011 got the party started. 6.61 inches of rain in less than 7 hours. Flash flooding. Kids in kayaks. Curb trash. A plan to dump our water into Lake Michigan via an 8-foot diameter tunnel was working its way through the process when the pricetag and environmental concerns landed it on the spring ballot. The residents said "no thank you," to which then-President Greable said “non-binding” and plopped it dead center into the Village's first Stormwater Master Plan. The Village sold $16.5MM in bonds and created the Stormwater Utility to pay for it. Eventually, the VC declared itself guilty of tunnel vision, shelved the tunnel, and set its sights on moving the water west. Enter, Strand and Associates with its non-tunnel, non-pump best practices for a 100-year rain event. After reviewing all $57,717,000 of Strand's recs, the VC decided “the water has to have someplace to go first…” and sent then-Trustee Rintz to negotiate with the Cook County Forest Preserve. Ash Street Pump Station to reduce draw-down times and flooding the the Ash/Hibbard neighborhood. Spruce Outlet (Lloyd) to reduce flooding from Maple Street south to Spruce Street. Spruce Outlet (Tower) to reduce flooding along Spruce Street east to Lake Michigan, and along Tower east of Old Green Bay Road. Winnetka Avenue Pump Station to drain SW Winnetka more effectively. Greenwood/Forest Glen storm sewer system to relieve overland flooding and drain NW Winnetka more effectively. Boal Parkway Improvements and pump station to help relieve ponding. Reinstatement of incentives for residential backflow prevention and overhead sewers. Lincoln Avenue parking lot permeable pavers to address water quality and flooding in parts of north Lincoln Avenue. This is not just a southwestern Winnetka problem. Think: kids to school, commuters to the Edens, nannies to Mariano's, and everybody to Soccer Saturday. It's that kind of "we're in this together." There is no drawing board. There is no going back. The VC wants you to reeaally, reeaally want this. The Forest Preserve Board will be watching. Read Up – two years of work and every page shows it. Trust us. You will want to know what's in it. Show Up – Tuesday, August 1st, 7:30, Village Hall. Speak Up – Especially if you've pumped, bailed, or put Stanley Steamer on speed dial. Check In – If you can't make the meeting, tap, click or dial. Questions go to Trustees; comments go here. This is Big Picture. Your own stuff still needs you, and the Village is here to help. Plus, there's this nifty Stormwater Q&A. Still have questions? Trustees and Public Works are standing by. Spot Check: What's it Take to Rock Winnetka? Tats and piercings, polos and khakis, studded boots and flip flops. Hipsters, ex-hippies, suits, and suburbanites. Welcome to 60093, Winnetka Music Festival-style. What started out last Friday evening as two headliners and a handful of food and drink stop-offs, was rinsed and repeated Saturday with a somewhat smaller, younger daytime crowd that amped up as the sun went down. Headcount: 10,000+. Seventeen acts and 18 local artists including headliners and buskers on four main stages and dozens of intimate venues delivered rock, jazz, country, and “light” rap hand-picked for NorthShore headsets. During the 2-day festival, two-year-olds, thirty-somethings and people who remember Woodstock helped Winnetka’s restaurants break their numbers and make new friends. No hiccups? No way, but for this year, litter and behavior was suburban-civilized. Skeptics were deafeningly silenced. High-fives. Back slaps. Victory laps. So what did it take to pull off the Feel Good Event of the Year? For Val Haller, a key organizer, founder and CEO of Valslist, and longtime Winnetka resident, her dream of a suburban Lollapalooza took a “highly curated, handpicked lineup” aimed straight at the tastes of the North Shore. “Every single band is one of my top bands and I knew they would appeal to a wide age range…families and grandparents and everyone in between…"
Jetta Boschen, PR Chair, got the word out early and often with a “a strategic grassroots campaign across all media platforms.” She plans “to continue our efforts as breaking news occurs in anticipation of 2018!” and invites everybody to visit the Festival's website to leave comments and sign up for next year’s news. Oh, and It didn’t hurt that WXRT featured the Festival in their 93 Days of Summer Calendar, and that for more than 10 years, Valslist has been building a sweet reputation for promoting and supporting emerging artists. Cred counts. Northfield Farmers’ Market – Saturday mornings, New Trier West Parking Lot, Happ Road, Northfield. ...or just hangin’ at one of our great eateries, bocce in Hubbard Woods Park, or meeting friends at the dog beach. See ya! Spot Check: Let's Make a Deal - The VC Jump Starts the Downtown Master Plan? Winnetka’s own candidate for "Desperate Landscapes" is about to get a makeover. And the terms “public-private partnership” and “TIF” are about to get a workout. Vroom-vroom, Fred's Garage. Fred's Garage, at the corner of Spruce and Chestnut, has been behind chain link for the past year. The developer was planning to spend $63,000 on pots, plants, and curb cuts when he found out the Village was going to do pretty much the same - just not right now, and not just there. Instead, on tap for 2017 was $370,000 of signs, bike racks, parklets and a post office site evaluation - early action items from the Downtown Master Plan. Nevertheless, the developer said "Let's chat." To which the VC replied, "Hmmm." In the DMP, but on the shelf for now, was a $482,000 reno of that entire block - infrastructure and streetscape - from Spruce south to the alley, both sides. On March 7th, Team Winnetka wondered what would happen if it stuck a pin in the early action items, took that $370,000 and the developer's $63,000, found a source for the remaining $49,000, and showed residents and future developers what downtown revitalization really looks like. Years ahead of schedule. Trustee-on-trustee ensued. Some raised eyebrows, others leaned in. The project could show quick results while waiting for One Winnetka's part of the streetscape plan to get going. The project's per-unit-cost data could help future developers and the Village bid better. Other people’s money could help get done what was on the books anyway. The corner wouldn't need to be redone to DMP specs later. The VC would DIY the project, shaving bucks from Teska's management fee. Would going off-script risk action items? Would piece-mealing make rollout of the Master Plan harder? Would the payback be worth changing course? Would this set a too-interesting precedent? Would adjacent properties want in? Does the project go far enough? Could we get more for our money? Can it be done during this construction cycle? Can their vision and our vision find happiness? Over the next several weeks, the VC will look at financing options, review the old "don't-call-it-a-streetscape plan" and possibly have a sit-down with its authors, the Lakota Group, (of the Hubbard Woods Park, Duke Childs Field, and Lakefront renos) to see if there's any "there" still there. And find out if any other retailers want in. Without losing sight of those bike racks, parklets, signs and Post Office eval. Oh, and staff will keep the convo going with the developer. Same page on notice. Five of them were proposed, one was discussed. The rest are in the pocket in case the TIF doesn’t win the toss. Think special service areas, home rule sales tax, business district designation, and land write-downs, with fund-raising a distant 5th. Tax Increment Financing. Controversial. Uses the increased taxes from the increased value of a development to pay for the cost of developing property. No new taxes, no bonds, no dipping into reserves. Sweet if property increases in value. Urban development economic death-spiral if it doesn't. And then there's a little issue of who gets the cash if it pays off early and becomes the gift that keeps on giving. Step 2: If doable, find out if there's still a taste for TIFs. Step 3: Go, no go. If no go, special service areas and home rule sales tax are up next. Dateline: "early this summer." Pricetag: $30-50,000. That bocce court in Hubbard Woods? Look across the street. Goodbye, Hubbard Woods Motors. Buongiorno, Mino's Italian Ristorante. Then there are the acquisitive Hoffmanns who think Winnetka's waaay overdue for a face-lift. And our new full-time Economic Development Coordinator whose job is to BFF future Winnetka businesses. This "partnership," and a TIF might make all of their lives a lot more interesting. Ours, too. Less park, more bike racks on steroids - for humans. Particularly for humans under the age of 40. It's a thing with urban planners right now. Trades parking spaces for public places. Economics vs demographics. Will make for interesting convos. Picture yourself parked here, here, and here. Enough about Them - What about You? If you've read this far, you'll probably be interested in the Village's eDevelopment newsletter. We should have told you about this sooner. Our bad. Want more DMP? Subscribe to the Village's eWinnetka, and bookmark the Calendar and Agenda Materials for what will be discussed when. Want more amperage? The Winnetka Music Festival. Sign up for their newsletter and get ready to rock out. Winnetka gets more interesting every day. We promise to keep you informed. Spot Check: The Downtown Master Plan - What Kind of a Big Deal is This? Oh, way more than street signs, bike racks, and parklets. One Winnetka - now The WINN - is just the beginning. Winnetka has several more parcels ripe for development. Two - one in Hubbard Woods and another in West Elm - are “in flight” even as we speak. And then there's that Post Office site. If it gets it wrong, it will lock the Village in a divisive game of “where’s mine” for decades to come. It’s that kind of a Big Deal. And the Trustees know it. That Study Session on January 10th? That was them hitting full stop/hard return. An Ordinance on the proposed 5-person Implementation Task Force, and a $450K Early Action Plan was headed straight for the January 17th Agenda Packet. Whereases, motion, second, vote, and adjourn. A good day for street signs, bike racks, and parklets. Low-Hanging Fruit was, Well…Too Low. Trustee Lanphier: Wants the Implementation Task Force plus two. Thinks involving the Advisory Boards is a good idea since they know our zoning laws and why the Village looks like it does in the first place. Trustee Rintz: Cautions that the original DMP was big picture, declares it's drill-down time. Thinks Streetscape - the plan and the details - could jump-start the DMP, saving time and money if there's any "there" there. Trustee Myers: Me-too's the Streetscape revisit, wishes he'd known more about it sooner. Wants to Goldilocks the size of the Task Force, and thinks it can help the Council move forward faster. All it needs is the right direction. Trustee Ziv: Says it's not that complicated, has had enough meetings. Thinks Teska can help the Task Force, and doesn't see that much work left. Trustee Cripe: Thinks Job #1 is to validate the Plan and prioritize. Wants more info on the C-1 and C-2 Retail Overlay Districts, what kinds of businesses are allowed there right now, and the permitting process. Let's start with reviewing special use permits. Cue Revised Scope of Work. Broaden the task force to add “a few” at-large members. Job 1: Review the "Downtown Physical Infrastructure Plan,” AKA Streetscape. TBD 3-4 months. Multi-task. Schedule Council Study Sessions on zoning (code for Retail Overlay Districts including a list of permitted and special uses) and on streamlining the Planned Development Process. Explore financing options. Big Deals need Big Bucks. On the table, taxes to TIFs and everything in between. Provide Advisory Board Commissioner training. Start from scratch – how to hold meetings, parliamentary procedures, etc. - or train them to implement the Plan? TBD. Way down the list, but on everybody's mind. In the meantime, Channel the Trustees. Winnetka's Retail Overlay Districts and why. Northbrook’s thinkin’ it wants more retail overlay. Special uses, exceptions. It's been a long time since The Plan Commission saw a special use request it didn't like, A reason to reduce Village oversight, or temporary economic expediency? Rather than reduce the number and type of uses, Wilmette, maintains control by increasing the number of commercial zones to 9, so that the rght business is in the right place. TIFs and other ways communities pay for stuff like this. Warning: they’re controversial. But with Winnetka’s zero-based budgeting and balanced budget on the books, the VC will check ‘em out. The 2009 Streetscape Plan. Relevant? Scalable? Jurisdictional Transfers. Wilmette did it. So did Kenilworth. And both got the RTA to help fund it. Our ability to control our share of Green Bay and Sheridan roads makes the job of creating a consistent downtown just that much easier. The VC wants to discuss. Our neighbors. Glencoe is patting itself on the back for its recent “tune-up,” and Wilmette's residents and businesses are lovin' the results of its newly-minted DMP. Pay attention to communities you like and why they work for you. Share with your Trustees. Subscribe to E-Winnetka or E-Alerts to follow the process. Check the Agenda Packets for what will be discussed when. Connect. Contact the Trustee of your choice with smart questions and insights. They'll thank you, trust us. Spot Check: One Winnetka Best Practices or a Cautionary Tale? On January 3rd, in its first executive act of the new year, the Village Council gave six thumbs up to the ordinance to grant preliminary approval of One Winnetka. This past Tuesday, it approved the Ordinance and Development Agreement, green-lighting the largest privately-funded development Winnetka has ever seen. Spot Check: $64 Mil. Your Money. In Their Hands. Your Move. It's that time of year when the people you elect to take care of business, tell you how they're going to do just that, then bill you. Twice. Spot Check: Downtown Master Plan - What's in Store for Winnetka? We’re smart. We’re affluent. We’re just not hip. Ouch. How the Downtown Master Plan intends to fix that. If we build it, they will come. With their kids and their credit cards. So says the DMP Steering Committee after 12 months of resident input, market research and $147,920 in consulting fees.